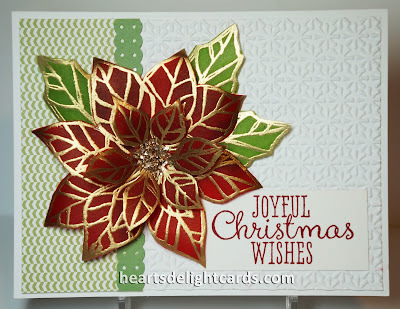 So, today I'm sharing a pretty Christmas card made with the Joyful Christmas stamp set. This is a card to be sent to someone special, since it takes just a tiny bit more time and effort to produce, but it will knock their Christmas stockings off when they receive it! And yes, it is mailable! The poinsettia was heat embossed in gold on vellum cardstock, but instead of coloring the back (stained glass technique), it was colored on the front for a deeper color. After coloring and drying, the excess ink was buffed off the gold embossing with a tissue, the flower was cut out, and petals curled by a bone folder. Stamped/embossed/colored image again, and fussy-cut just the inner petals. Attached to flower with Mini Glue Dot. Placed a good size dollop of Crystal Effects in the center and covered with Champagne Glass Glitter. 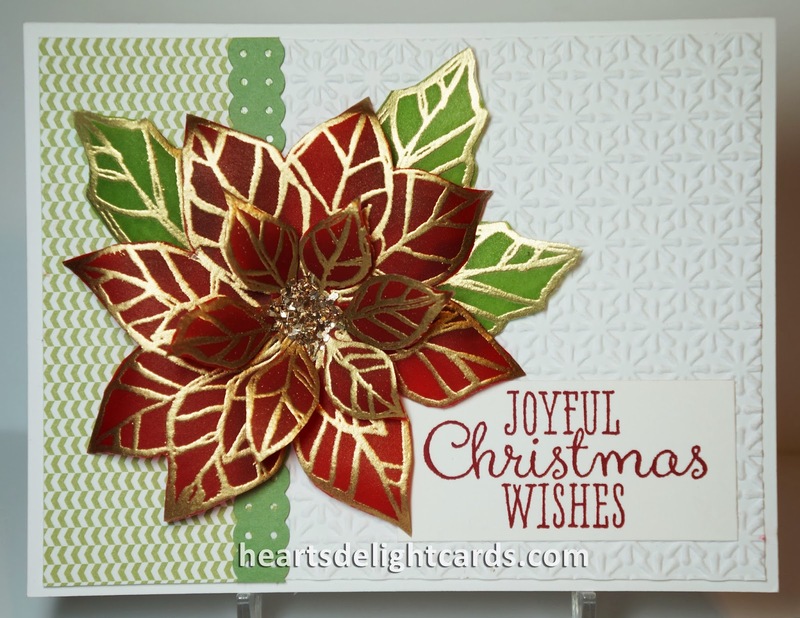 When completely dried, excess glitter was tapped off and poinsettia added to the card with a Stampin' Dimensional. Okay, off to dream up more cards, and plan the holiday baking schedule. How are YOU doing with your holiday preps? If you signed up for my mailing list, you'd be getting weekly ideas from the 12 Weeks of Christmas. It's easy, just subscribe using the link on the upper left! I really like the way you did the colouring on the front of the velum leaves for the richer tone! TFS love your posts.